The RightBooth Event Publisher lets you take all the recorded videos and photos for an event and copy them to a removable storage device such as a USB data stick. The device can then be given to event attendees to allow them to view the files on their own computer. Here we explain how to do this. When your event is finished, all the recorded videos and photo files will be saved on your computer. 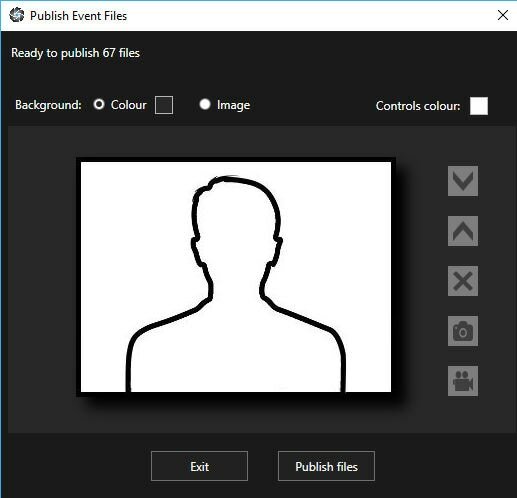 Choose a background colour or an Image to use as the background for the Event File Viewer app. You will then be asked to choose a folder in which to publish the event files. Browse to the root folder of your chosen device and click the OK button. The Publisher will now create thumbnails of your videos and photos and transfer them all to your chosen folder, along with the Event File Viewer application. You can then run the Event File Viewer app (Viewer.exe) which you will find in your chosen folder to browse and view all the published photos and play all the published videos. You can repeat this process as many times as you like to publish multiple copies of the event's videos and photos.